Dixie State dropped a non-conference matchup at Central Washington on Saturday, falling 40-18 to the Wildcats at Tomlinson Stadium in Ellensburg, Wash.
Dixie State finished the game with 362 yards of total offense (276 pass, 86 rush), falling short of the 100-yard rushing mark for the second consecutive game. Quarterback Josh Thompson went 15 of 24 for 238 yards and a touchdown with one interception. Aubrey Reed led all receivers with four catches for 125 yards. Orlando Wallace finished with seven catches for 84 yards and a touchdown, with another 46 yards rushing. Clifford Simms finished with 41 yards and one touchdown on 11 carries. The Trailblazers allowed 490 yards of total offense to CWU (275 rush, 215 pass), the most DSU has given up in four games this season. Safety Colton Olson finished with a team-high nine tackles, while linebacker Peter Brown added eight tackles. Defensive lineman Keanu Foki and linebacker Shiloh Pritchard each finished with six tackles and combined for one sack. For full game story, click here. DSU returns home to host Western State Colorado at Legend Solar Stadium on Saturday. Kickoff is set for 1 p.m.
On Saturday, the Trailblazers won the first two sets by matching 25-12 counts and held a commanding 19-13 lead in set three against Holy Names University, but the Hawks rattled off a 7-1 run to pull even at 20-20. However DSU would go on to score the final five points of the stanza to close out the match, 25-20. 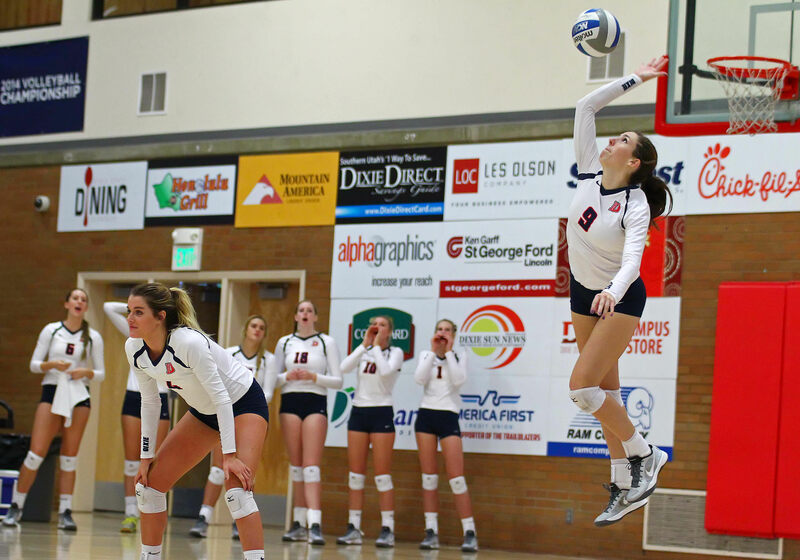 Dixie State hit Holy Names with a balanced attack as Lindsay Garrett, Brette Anderson and Taylor Duryea each finished with seven kills, while Kayla Chapman and Jaydra Thurber notched five kills apiece. DSU hit .250 for the match, including a season-high .500 clip in the opening set, and held HNU to an opponent season-low -.082 percentage. Dixie State’s defense also collected 15 blocks in the match, highlighted a career-high tying nine total blocks by Garrett. Against University of Hawaii-Hilo Monday night the Trailblazers won the first set 25-18 and led 11-8 in set two, but the Vulcans used a 9-3 run to erase the deficit to take a three-point lead of their own en route to a 25-21 win in the frame to knot the match at 1-1. Dixie State never trailed in set three and took a 2-1 lead in the match after a 25-22 win in the stanza and again had a multiple-point lead in frame four, but again UH-Hilo would rally and held a 21-18 advantage late in the set. DSU battled back to pull even at 21-21 and won seven of the final eight points overall to close out the match, 25-22. DSU outside hitter Delayne Daniel returned to the lineup after resting an injury and led the way with 16 kills and nine digs, while OH Taylor Duryea added 11 kills with seven digs. DSU hit .214 in the match, including a .310 percentage in set one and a .255 clip in the deciding fourth set. The Trailblazer defense held Hilo to a .169 hitting percentage, thanks in part to a game and career-high 26 digs from libero Sidney Brandon and seven total DSU blocks. Lindsay Garrett was named PacWest Defender of the week last week. That followed up Delayne Daniel’s amazing week when she was named PacWest player and NCAA West Region player of the week. Dixie State will play its final non-conference regular season match this Wednesday, Sept. 28, when the Trailblazers head to Salt Lake City to face Westminster College. DSU will then return home for three-straight PacWest games, starting with a date vs. Chaminade on Saturday, Oct. 1, at 6 p.m., inside the DSU SAC. Against Azusa Pacific Thursday night DSU opened the scoring early in the 21st-minute when Moises Medina played a ball to the left wing to Ather Dawood, who fired home a blast from 15-yards out to score his second goal in as many matches to give the Trailblazers a 1-0 lead. Dixie State tallied an insurance goal midway through the 50th-minute when Gabby Medina won a scramble for the ball and found freshman Christian Hall, who found the back of the net from 18-yards away to pad the advantage at 2-0. DSU held onto win, ceding APU’s sole goal of the match nine minutes into the second half. DSU picked up its first-ever win over the Cougars in six matches. Goalkeeper Bradley Trella had three saves to earn the decision in goal. On Saturday night forward Christian Hall scored the fastest goal in Dixie State men’s soccer program history, and that goal proved to be the difference, as the Trailblazers won their fourth-straight with a 1-0 result against Point Loma Nazarene in San Diego, Calif.
DSU played the ball into the Sea Lion third at the opening kick and after a broken play in front of the PLNU goal, Dominic Damato flicked the ball to Hall, who found the back of the net just 37 seconds into the match to give DSU a 1-0 lead. Dixie State’s defense held Point Loma to just two shots on goal. Trella made saves on both attempts to post his first solo shutout of the season. Prior to Hall’s record-breaking goal on Saturday, the fastest goal scored in DSU history happened on Oct. 12 2013, when Nadav Elimelich tallied a goal just 1:24 into play in a 3-1 loss at Holy Names. On Tuesday night Dixie State again posted a 1-0 shutout, this time against Holy Names University. The Blazers tallied their lone goal of the match midway through the 32nd-minute when junior Bryan Baugh sent in a powerful inbound throw to the middle of the Hawk penalty area to Moises Medina, who headed home his first collegiate goal past the drawn out HNU keeper to give DSU a 1-0 lead. Trella again stopped both shot attempts on goal to pick up his second-straight shutout win in goal. Dixie State is currently sitting in 1st place in the PacWest and will host defending PacWest champion Fresno Pacific this Saturday night at Legend Solar Stadium beginning at 5:30 p.m. The two teams played for the PacWest championship in the final game of the season last year. 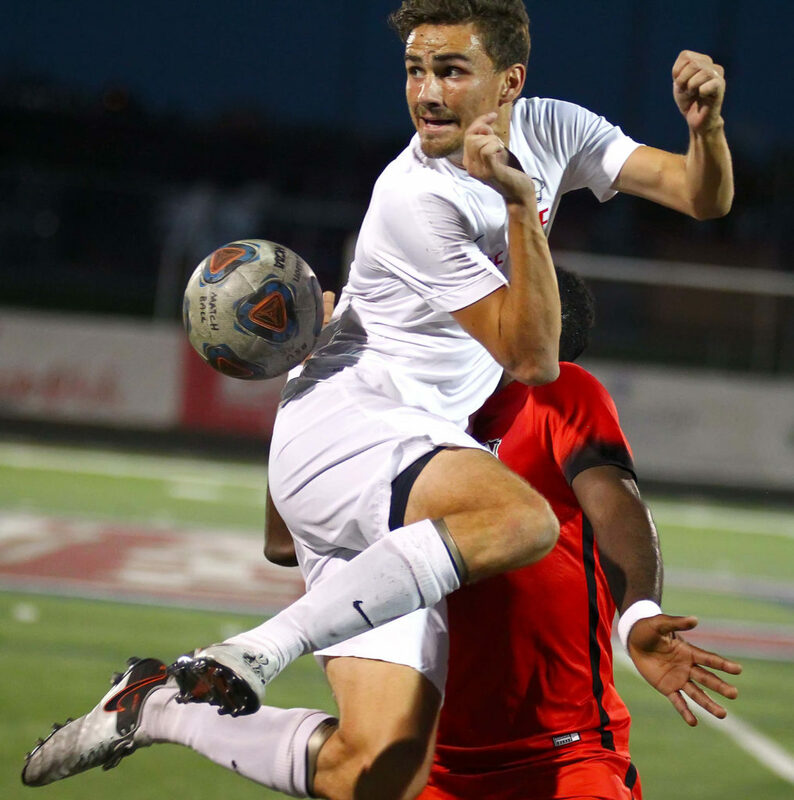 Dixie State opened Pacific West Conference play on a sour note as the Trailblazers were shut out at Azusa Pacific, 2-0, Thursday night in Azusa, Calif.
After both teams played a scoreless first half, the Cougars erupted for two quick goals five minutes into the second stanza. DSU was held to just two shots on goal and six total shot attempts for the match, three in each half. Darian McCloy led led DSU with three shot attempts, while sophomore Nichole Mertz and Megan Spencer accounted for both Trailblazer shots on frame. Goalie Angelica Ciucci made five saves in a losing effort. Saturday afternoon DSU took an early first-half lead against Point Loma but could not hold onto it and lost 2-1 in San Diego, California. DSU got on the board with a little more than three minutes remaining in the first half when McCloy tallied her fourth goal of the year off an assist from Montana Hadley to give the Trailblazers a 1-0 lead. The Sea Lions pulled even 10 minutes into the second half and took the lead with 24 minutes to play. DSU could not net the equalizer before time expired as the Point Loma held on for the victory. PLNU outshot Dixie State 15-11 in the match, though shots on goal were even at six apiece, with Kilee Lamb accounting for three of the Trailblazers’ six shots on frame. 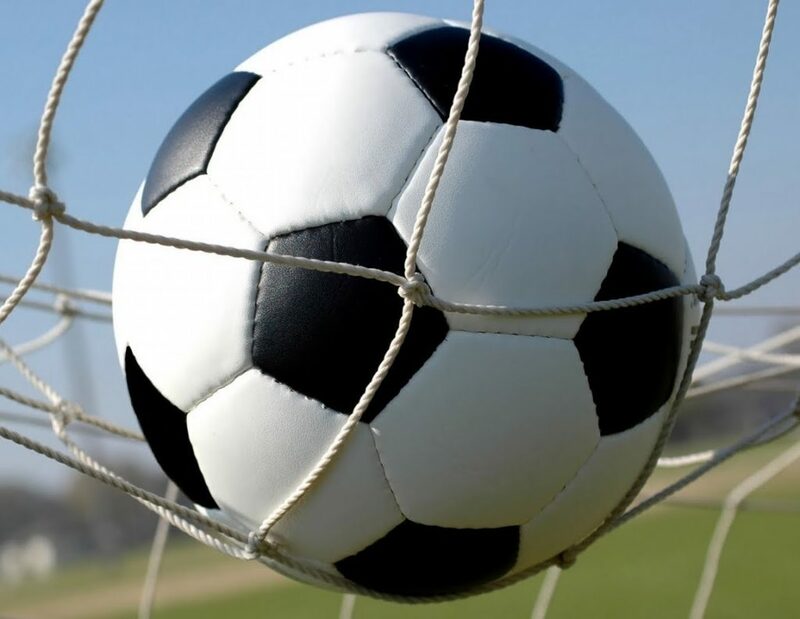 Dixie State halted its losing skid and picked up its first Pacific West Conference win with a 1-0 result over Holy Names Tuesday night at Legend Solar Stadium. After both teams played through a scoreless first half, Dixie State broke the deadlock midway through the 57th-minute when Lamb played a centering free kick from the right wing to Aubri Detmer, who scored from 25-yards out to put the Trailblazers up 1-0. DSU’s defense made that one-goal advantage hold up as the Trailblazers limited Holy Names to only two total shot attempts the entire match. Goalie Felicity Tarr recorded her first collegiate solo shutout victory. Dixie State finished with 21 shots, eight on frame, with Alexis Torres and McCloy collecting four shot attempts apiece. Dixie State will return to action this Saturday night as the Trailblazers host Fresno Pacific at Legend Solar Stadium beginning at 8 p.m.
Campus Rundown is a column by St. George News’s Darren Cole and explores the different athletic events on the campus at Dixie State University.